The Rockin’ Berries were the second Brumbeat group to have a hit record although they had been around for quite a few years prior to that and the line-up had undergone many changes. The origins of the band go back to the late 1950’s when Brian “Chuck” Botfield (born 14 November 1943, Birmingham), and Geoff Turton (born 11 March 1944, Birmingham), met while attending Turves Green School and playing clarinet in the school band. Chuck Botfield later went to Moseley College of Art where he formed a skiffle group with fellow Turves Green school-mate Tim Munns who played bass guitar along with guitarist Bob Bates, drummer Barry Taylor, and piano player Christine Perfect from Bearwood who would become a well known blues singer in the later 1960’s – she eventually became Christine McVie of Fleetwood Mac (see Chicken Shack). The group was originally called “The Bobcats” and later the “Rockin’ Berries” as they played a lot of Chuck Berry songs and their first booking was at the Cofton Community Centre in Longbridge. Singer Paul Hewitt and guitarist Doug Thompson who both worked at the Austin Motors were putting together their own group in 1959 along with drummer Terry Bond (born 22 March 1943, Birmingham) and bass guitarist Mark Johnson. In search of a good lead guitarist, they learned that the Rockin’ Berries were disbanding and so invited Chuck Botfield to join them. Botfield agreed providing that the new group would also call themselves the Rockin’ Berries. Doug Thompson made a deal with the owners of the disused Palace Theatre in Redditch that the Rockin’ Berries would play there and keep the door takings in return for cleaning the place up. The arrangement proved so successful that The Rockin’ Berries started playing there regularly along with many other local groups. Meanwhile, original Rockin’ Berries bass guitarist Tim Munns had joined up with another former school friend Geoff Turton and singer Bob Lawton in a line-up known as “The Chimes”. They were moderately successful locally – even winning a Birmingham Parks Band Competition. Tim Munns re-joined the Rockin’ Berries at the request of Chuck Botfield when Mark Johnson left the band to pursue a full-time career. By this time, the Berries were very well-known locally as they were now fronted by two vocalists; Paul Hewitt (now with the stage-name of Bobby Thompson) and Jimmy Powell – easily one of the most powerful singers in the West Midlands. The complete line-up of the Rockin’ Berries at this time was Chuck Botfield (lead guitar), Doug Thompson (rhythm guitar), Tim Munns (bass), Terry Bond (drums), Dennis Ryland (tenor saxophone), Paul Hewitt and Jimmy Powell (vocals). In November 1961, the Rockin’ Berries were offered some bookings in Germany which they accepted but Paul Hewitt did not want to go so local singer Clive Lea (born 16 February 1942, Birmingham), joined the group as his replacement. Clive Lea lived in Longbridge and had won the “Elvis of the Midlands” contest while being backed by his own group The Phantoms. Lea was quite well known around Birmingham at the time as a singer and impressionist. Upon returning from their tour of Germany, the Rockin’ Berries were auditioned by TV pop music promoter Jack Goode who was scouting for the Decca Record Company. The group failed to secure a contract but Goode showed interest in signing singer Jimmy Powell. As the Rockin’ Berries had a return engagement in Germany, they returned there but when offered an extension to stay longer, the group was divided over the prospect of remaining and the outcome was that Doug Thompson, Dennis Ryland and Jimmy Powell returned to Birmingham leaving the others to carry on in Germany. Jimmy Powell would take up Jack Goode’s offer of a recording contract and become the first “Brumbeat” recording star in 1962 (see Jimmy Powell). Doug Thompson embarked on a new career and became well known around Birmingham as a music promoter and booking agent. The remaining Rockin’ Berries needed a replacement vocalist to complete their engagement and Chuck Botfield remembered that his former schoolfriend Geoff Turton was playing guitar in a group back in Birmingham called the Swinging Chimes. 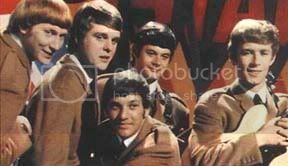 When contacted, Geoff Turton agreed to join the Rockin’ Berries in Germany and it was soon discovered that Turton also posessed a unique falsetto vocal style that was used by the group to their advantage when performing songs such as Frank Ifield’s I Remember You and Sherry by the Four Seasons. In this way, the group was unusual in that it had two lead vocalists in Clive Lea and Geoff Turton. Another line-up change also occurred at this time when Tim Munns left to be replaced by bass guitarist Roy Austin (born 27 December 1943, Birmingham) from Sir Hiltons Road, West Heath. He was previously in a local group called The Eko’s. Tim Munns went on to work for Kinks manager Larry Page and later re-joined Jimmy Powell in his band “The Five Dimensions”. When the Rockin’ Berries returned to Birmingham, they were contacted by Decca Records who had been sent a demonstration tape of songs by the group. 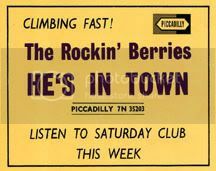 The Rockin’ Berries were signed up and went to London to record with Decca Records releasing two singles, the second of which Itty Bitty Pieces got them a TV appearance on Ready Steady Go! but neither single was a hit. Despite this, the publicity generated served to increase their following and the group refined their stage shows by introducing comedy which included impersonations from Clive Lea. After a year they were dropped by Decca and then signed to the Pye subsidiary Piccadilly by talent scout John Schroeder who also became their manager. Their first release on this label I Didn’t Mean To Hurt You, was a minor hit and featured Geoff Turton’s distinctive falsetto vocal which became a band trademark. The Rockin’ Berries appeared at London’s famous Marquee Club where they were seen by American record producer Kim Fowley who would play an influential role in the careers of a number of Midlands groups. Fowley was impressed by the Rockin’ Berries and decided that they should record a version of a song written by famous composers Goffin & King called He’s In Town as performed by The Tokens in the USA. Re-recorded by the Rockin’ Berries and released as a single in October of 1964, the song went to No. 3 in the charts. The next Rockin’ Berries single What In The World’s Come Over You was less successful and reached No. 23 but the next single Poor Man’s Son again made the top ten in May of 1965. The song featured a lead vocal from Clive Lea and was a cover of a song by the US group The Reflections. 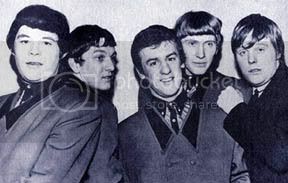 At this time, bass player Roy Austin left the Rockin’ Berries and was replaced by Bobby Thompson from Liverpool who had played in Rory Storm & The Hurricanes, a group that had at one time included Beatles drummer Ringo Starr. By coincidence, Thompson had the same name as was used on stage by one-time Rockin’ Berries singer Paul Hewitt. A Rockin’ Berries album entitled In Town was released in 1964 and got to No. 15 in the album charts but the group seemed to have reached their peak in chart terms and subsequent single releases comprised of more cover versions. The group was certainly at a disadvantage from not having internal songwriters but as the hits became fewer, they concentrated on a career in cabaret which included comedy routines featuring Clive Lea’s impersonations of Norman Wisdom and George Formby. By the time of the Rockin’ Berries last hit The Water Is Over My Head in 1966, the pop music scene had changed and the era of the beat groups was over. The band was by this time one of the UK’s top cabaret acts who were heavily in demand for bookings all over the country. One of the more notable engagements for the group took place when they were invited to and performed at 1967’s Royal Variety Performance attended by The Queen and Prince Phillip. At the height of the psychedelic era, the song Yellow Rainbow was recorded by members of the Rockin’ Berries and was apparently composed by Roy Wood of The Move who may have also contributed backing vocals. Unfortunately, the recording was never released although it was certainly commercial enough to have made the charts at the time. In 1968 Geoff Turton left the band and briefly joined the Birmingham group Sight And Sound but with encouragement from manager John Schroeder, soon embarked on a fairly successful solo career (see Jefferson). Yorkshire singer/impressionist Terry Webster joined the Rockin’ Berries in 1970 to replace Clive Lea who left to start a solo career as an impressionist and later joined local comedy group The Black Abbotts as replacement for Russ Abbott. The remainder of the Rockin’ Berries continued to perform in cabaret as a music/comedy act although drummer Terry Bond later moved into management and was replaced by Keith Smart, previously from Roy Wood’s chart-topping group Wizzard (see The Move). Despite numerous other personnel changes (which include occasional appearances with Geoff Turton), the Rockin’ Berries along with remaining original member Chuck Botfield, continue to be a popular attraction on the cabaret and nostalgia circuit to this day. To see a review of the Rockin’ Berries remastered double-CD anthology, check out the Brumbeat Reviews page. and to Clive Lea and Tim Munns for assistance in writing this bio.